Belle Isle was home to the Detroit Grand Prix from 1992-2001, utilizing a temporary street circuit that was constructed specifically for the Championship Auto Racing Teams' (CART) races. In 2007 and 2008, it once again hosted world-class racing with both the open-wheel cars of the Verizon IndyCar Series and the sports cars of the American Le Mans Series competing at the event. After a four-year absence, the Chevrolet Detroit Grand Prix presented by Lear returned to the island in 2012 with Verizon IndyCar Series, GRAND-AM Rolex Sports Car Series and Pirelli World Challenge Championship Series races. The same three racing series competed at the event in 2013 on the newly-reconfigured 2.35-mile Belle Isle street circuit while featuring the first doubleheader race weekend in the Verizon IndyCar Series. In 2014, the Grand Prix hosted a picture-perfect weekend on the Detroit River featuring another Verizon IndyCar Series doubleheader race weekend - the Chevrolet Dual in Detroit. The new unified sports car series also competed at Belle Isle with the TUDOR United SportsCar Championship and the Pirelli World Challenge Series also returned to the island. For the first time, the SST Trucks raced at the Grand Prix in front of the over 110,000 fans in attendance on race weekend. The same lineup returned in 2015 and brought 65,000 people down to Belle Isle during a rainy Grand Prix weekend. In 2016, a crowd of 95,000 witnessed another action-packed weekend of racing featuring the Verizon IndyCar Series competing in the Chevy Dual in Detroit with the IMSA WeatherTech SportsCar Championship, the return of the Trans Am Series and the SST Trucks. In 2017, the Grand Prix was back on Belle Isle as 100,000 fans enjoyed all the weekend action featuring the Verizon IndyCar Series races, the IMSA WeatherTech SportsCar Championship, the Trans Am Series presented by Pirelli and the SST Trucks. According to an independent economic study, the 2017 Grand Prix generated $58 million in total spending for the region. Last summer, the Grand Prix returned once again to Belle Isle, entertaining the 105,000 fans by attendance with seven races from four series, including the Chevrolet Dual in Detroit Verizon IndyCar Series doubleheader, the Chevrolet Sports Car Classic, the IMSA Weathertech SportsCar Championship, the Trans Am Series presented by Pirelli and the SST Trucks. In 2019, the three-day racing festival returns to Belle Isle, May 31 - June 2, with the NTT IndyCar Series competing in the Chevrolet Dual in Detroit, the IMSA WeatherTech SportsCar Championship and the Trans Am Series presented by Pirelli. The island also includes a half-mile swimming beach, the only one in the city, and a nature center. The aquarium opened in 1904, making it the oldest public aquarium in the United States. Constructed, in part, by “the man who built Detroit,” Albert Kahn, the aquarium features an arched tile-green ceiling, designed to evoke the feeling of being underwater. Landscaped in the 1880s by Frederick L. Olmsted, the highlights of Belle Isle include the aquarium, James Scott Memorial Fountain and the botanical garden in the Anna Scripps Whitcomb Conservatory. The conservatory and the 1908 Belle Isle Casino were also constructed by Kahn, well-known for developing open-floor plan concrete factories. The casino building is not a gambling facility, but it is used for public events. Belle Isle also was home to a large herd of European fallow deer for more than 50 years. A few remain as exhibits at the nature center, but the last of the 300 animals was captured in 2004 and relocated. In the future, Belle Isle will feature a new garden designed by renowned designer Piet Oudolf, who designed the world-famous High-Line park in New York City, as well as parts of Chicago’s Millennium Park. With a past as storied as any place in Detroit, the future looks bright for Belle Isle. The Grand Prix continues its giveback to Belle Isle Park as over $13.5 million has been contributed to improvement projects on the island since the event returned in 2007. In 2018, $450,000 of the $1 million raised at the annual Grand Prixmiere charity gala for the Belle Isle Conservancy was dedicated to needed repairs that will help keep the iconic James Scott Memorial Fountain on the island operational for the coming years. 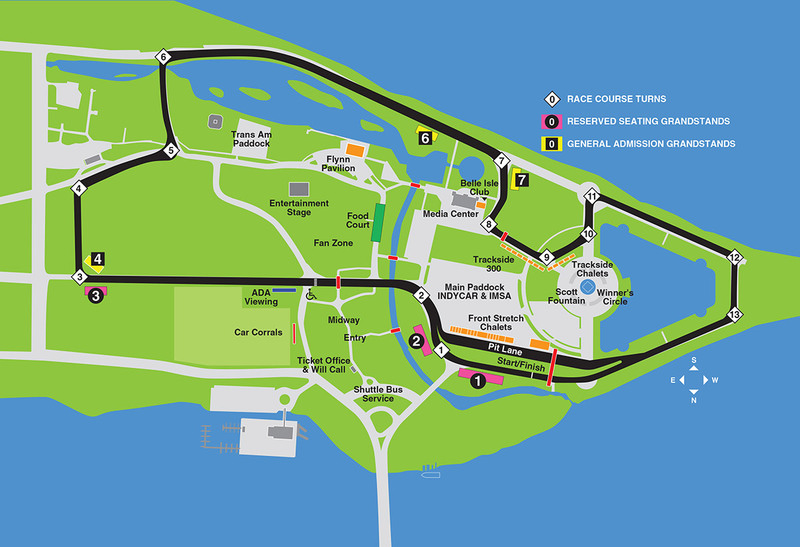 NOTE: View the latest information on access to areas and attractions on Belle Isle Park after the Chevrolet Detroit Grand Prix presented by Lear. Please view the guide for details.